Top acts from the comedy circuit, TV and radio will be appearing on Sunday 28 April, at the opening night of Canalside Comedy, at the town’s 115-seat Little Theatre. This is thanks to a chance meeting between two theatre members, Stacey Buss, a former comedy promoter, and Edmund Tirbutt, an ex-stand-up comic, during the latest Alan Ayckbourn production at the theatre. Stacey and Edmund have quickly turned their idea into reality, and tickets are now on sale for the first of the comedy nights, which will be on Sunday 28 April, at 8pm. It is a truly star-studded line up with TV comedian Jon Richardson as MC, and prolific radio performer and comic writer Nick Doody headlining. 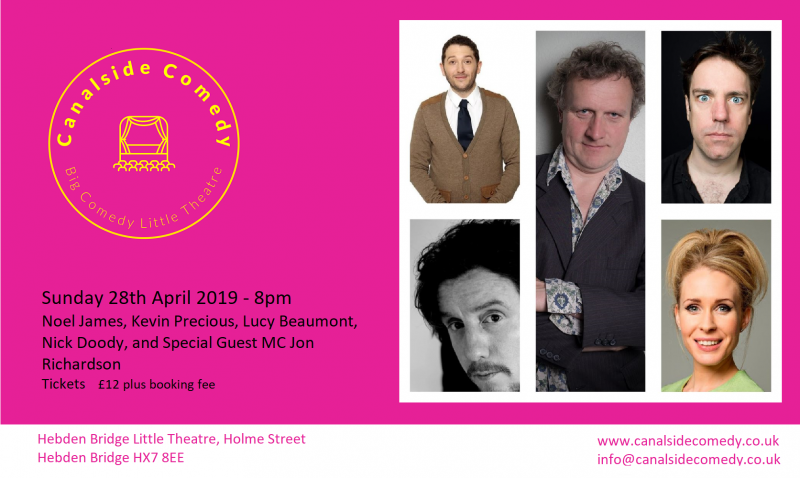 Others on the bill include Noel James, the Welshman who did so brilliantly on last year’s Britain’s Got Talent, Lucy Beaumont, the multi-award winning stand-up and leading radio sitcom actress and writer, and Kevin Precious – who has become renowned for his comic observations about his previous career as a teacher. This will be a cracking night, not to be missed!